Over the years Laurie Reid has been working with various properties of paper, color, solubility, and chance to dictate her explorations. In her residency at Aurobora, Reid extended her investigation with color application, minimal composition, and the use of an intaglio press as a way of experimenting with improvisation and chance. In her suite of monotypes, Reid embraces the concept of mutability as a thematic armature for her compositions. 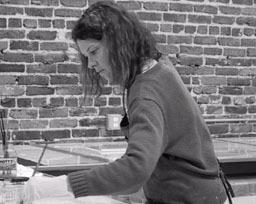 Reid’s fluid brush stokes, a reduced palette, wispy ink-to-plate applications and a single immediate pass through the press, were consciously self-imposed boundaries she set for the course of her residency. Each monotype was conceived on a narrow, horizontal band of paper (11’ x 30”) and in turn, these individual compositions were then aggregated to form a larger, singular installation. Laurie Reid’s improvisational suite of monotypes successfully capture both the openness of the medium as well as the underlying concept of notating subtle, visual change.